Last June at the DoubleClick Leadership Summit, we introduced Marketplace in DoubleClick Bid Manager as a way to help you discover, negotiate and manage premium publisher inventory from a single destination. “Marketplace has enormously streamlined the process of setting up private inventory deals by providing comprehensive publisher information with splits by audience segment. The efficiency and level of detail it provides simplifies the negotiation process and speeds up getting deals live". "Marketplace helped out a great deal when we needed to find and manage programmatic deals within multiple markets outside of Germany. The information given in the profile of the publishers has been helpful to evaluate whether or not the inventory would be a good fit for our client. The negotiations and execution are very straightforward and intuitive. It’s been a great experience thus far." Marketplace is a shoppable storefront where you can browse all kinds of premium inventory from top publishers for your programmatic campaigns. It also helps you save time and overhead because you can negotiate and manage your deals directly from Marketplace. Discover great inventory: Looking for video or mobile inventory on top news sites in Spain or Singapore? 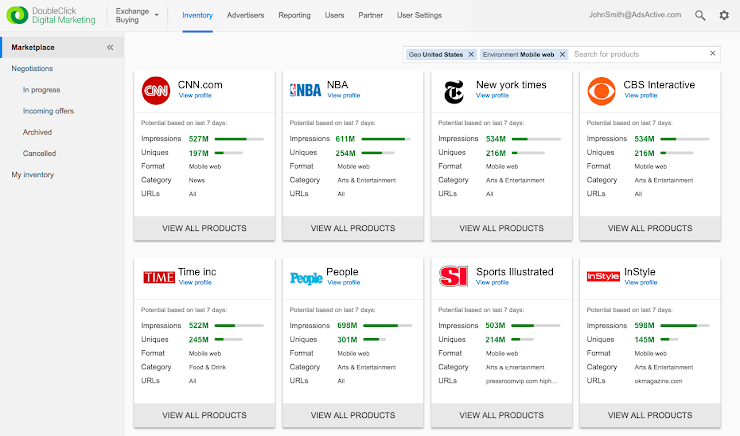 Marketplace lets you search for deals by publisher, format, geography, audience, vertical and much more. You can find all Programmatic Direct deals including private auctions, preferred deals and programmatic guaranteed. Streamline negotiations with publishers: With Marketplace, it's easy to contact and transact directly with publishers. Marketplace also keeps track of all deal negotiations, so your communications are organized and easily accessible. You can learn more about the available inventory and complete your media buy without ever having to pick up the phone. Get a single view of all your deals: Once you’ve reached an agreement, your new deal is automatically added to your Marketplace inventory library. Here you’ll get a single view of all your deals transacted in Bid Manager. Today, all Bid Manager accounts are eligible to participate in Marketplace (beta). We hope you'll find Marketplace just as useful for finding and buying premium inventory as our early testers have. Reach out to your DoubleClick account team to get started today.